Peterborough United's Connor Washington scores the winning goal against Sheffield United. Posh striker Conor Washington reckons he is now ready to emerge from the shadow of Britt Assombalonga. 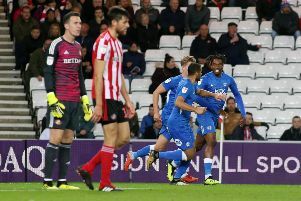 The 22 year-old claimed just his second goal in the last five months to seal a 2-1 victory at Sheffield United on Tuesday. Washington pounced on a fine flicked header from fellow substitute Aaron Mclean in the first minute of stoppage time before powering into the penalty area and firing a superb shot into the corner of the United net. The match-winning moment prompted chairman Darragh MacAnthony to insist that Washington would be a 20-goal-per-season striker with the right support. Washington has just eight goals so far this season which is still the best tally in the club. “I agree with the chairman,” Washington, who moved to Posh from League Two side Newport last year, stated. “I hit the ground running last season when I arrived at the club, but I had Britt alongside me then. “When he left I realised the responsibility for goals might be mine and I struggled with that at first. “I am only in my second season as a full-time professional and I put too much pressure on myself at the start of the season. “I’ve been in and out of the side as a result, but hopefully I’m through that now and I can start playing and scoring more regularly. “I was obviously buzzing with the goal at Bramall Lane. It was a great header from Aaron and I just gambled on getting on the end of it and then concentrated on getting a clean connection. “It was an unbelievable finish to the game and the lads have started talking about the play-offs again. “It’s been our aim all season to be honest, but the team spirit is excellent and we are relaxed and enjoying our football. Posh have 12 games remaining and could move into the play-off places on Saturday if they beat Orient and Doncaster lose at in-form Gillingham. Posh are currently ninth, but seventh-placed Bradford City and eighth-placed Chesterfield are without a fixture.